You only get so many hours a day to spend with your loved ones, so why waste those precious moments cleaning your house instead of enjoying family time? Our maid services are here to make your home cleaner, happier and healthier. Cascade Fresh wants to give you peace of mind knowing that your house is thoroughly cleaned, allowing you to relax with your family. 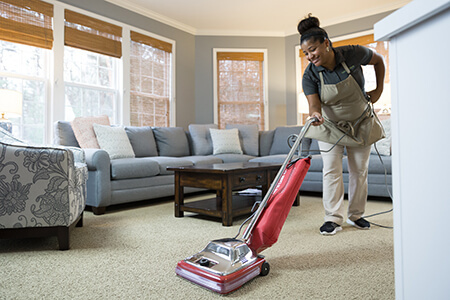 Our maid services use sanitized microfiber cleaning cloths and mop heads to clean your home, ensuring we do not bring outside germs into your house. In addition, each team member wears fresh gloves and shoe covers in your home so that dirt isn’t tracked in. Our products are safe for your home and the environment, but are still effective in removing germs. We use bathroom and kitchen products that are formulated to effectively disinfect the areas you want to be the cleanest. Floors can harbor germs and need regular care to avoid bacteria build-up. Cascade Fresh’s maid services wash and dry floors in your kitchen and bathrooms, keeping even the tiniest cracks and crevices dirt-free. Our team also vacuums rugs and carpets thoroughly. No matter what type of flooring you have in your home, we promise it will be so clean that you’ll actually want to walk through your house barefoot. We train our team members to clean every room in your home effectively and efficiently. Every day, we provide refreshers and reminders for effective disinfecting, keeping everyone up-to-date on the best cleaning methods and practices. Cascade Fresh remains professional and vigilant to help you maintain your healthy home. Our detailed house cleaning process is part of the excellent service we are determined to provide for you. Trust that our maid services will get the job done for you, allowing you to relax and enjoy more time with your family. After all, a healthy home is a happy home.